The proposed Cooma Town Clock. Photo: SMRC. A town clock for the centre of Cooma is a local talking point as Snowy Monaro Regional Council advances planning on the proposal. Cooma’s Litchfield family started the discussion with the donation of $100,000 for the installation of a clock in Cooma’s CBD. The gesture forms part of the 150th-anniversary celebrations of Hazeldean Pty Ltd, one of the region’s pioneering pastoral enterprises, which is owned and operated by the Litchfield family. In 2014, a community design competition was held and in collaboration with the Litchfield family a design was finalised. Council is now calling for community feedback on the idea via an online survey as well as hosting a number of pop-up stalls. The town clock will be located on the Vale Street and Sharp Street roundabout. At their December 6 meeting councilors allocated $50,000 towards the construction. With residents now being asked whether they support the project or not. Comment so far on Council’s Facebook page at least has been pretty split on the idea. To inspect the proposed designs, and to provide feedback visit Council’s website or pick up a feedback form at any Council office, library or visitors centre. The consultation will close at midnight this Sunday, March 10. “Or a pop-up information stall will be held on Saturday at the Cooma Show where people can inspect the designs and obtain further information from the project team,” Cr Rooney says. ‘The Shearer’ created by the late local sculptor, Rix Wright. Photo: Shapiro Auctions. Meantime, another link to the Litchfield family and a further addition to the colour and look of Cooma is progressing. Plans to position the bronze statue, ‘The Shearer’ created by the late local sculptor, Rix Wright are moving ahead. 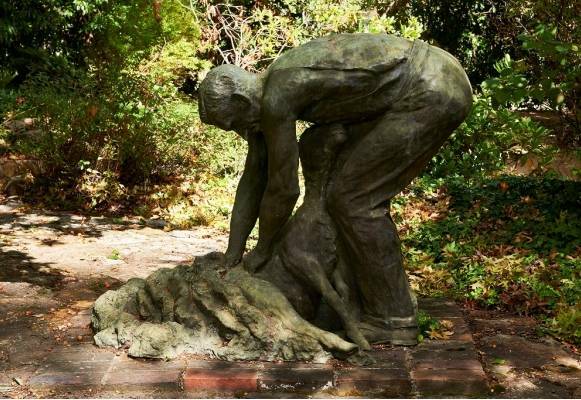 Council purchased the statue from the Litchfield’s in 2017, he is currently being stored safely while Council finalises the design and construction details that will see him permanently erected in Cooma’s Centennial Park. “He is a beautiful, life-size, bronze statue and we will be really proud to have him publicly displayed in Cooma,” says Council’s Manager of Tourism and Events, Donna Smith. Just put the bloody clock up. It would be fantastic for everybody.